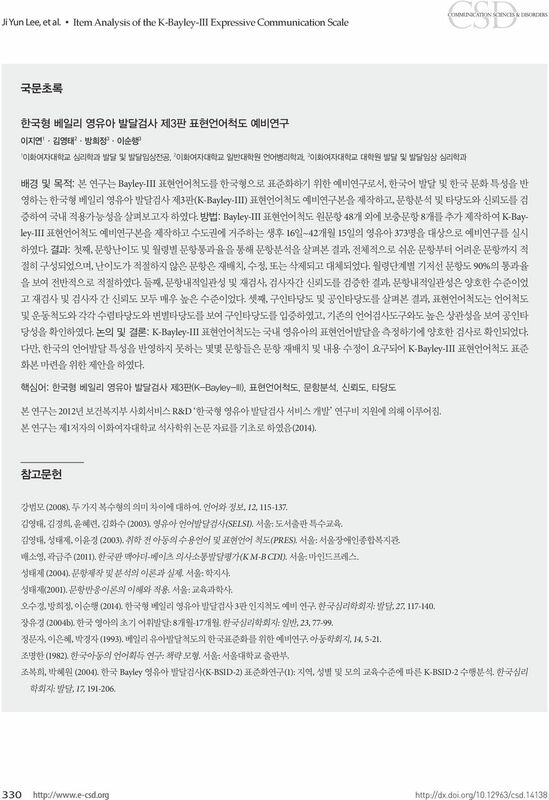 Download "한국형 베일리 영유아 발달검사 제3판 표현언어척도 예비연구 이지연 외 사소통발달평가 (Korean MacArthur Bates Communicative Development Inventory, K M B CDI; Pae & Kwak, 2011), 취학 전 아동 의 수용"
1 ISSN (Print) ISSN (Online) Commun Sci & Dis 2014;19(3): Original Article A Preliminary Study on Standardizing the K-Bayley- III Expressive Communication Scale Ji Yun Lee a, Young Tae Kim b, Hee Jeong Bang c, Soon Hang Lee c a Graduate Program in Developmental Psychology, Ewha Womans University, Seoul, Korea b Department of Communication Disorders, Ewha Womans University, Seoul, Korea c Department of Psychology, Ewha Womans University, Seoul, Korea Correspondence: Bang Hee Jeong, PhD Department of Psychology, Ewha Womans University, 52 Ewhayeodae-gil, Seodaemun-gu, Seoul , Korea, Tel: Fax: Received: July 4, 2014 Revised: August 23, 2014 Accepted: September 13, 2014 This work was supported by the research fund of Social Service R&D of Korean Ministry of Health and Welfare (2012). This article is based on a part of the first author s master s thesis from Ewha Womans University (2014). 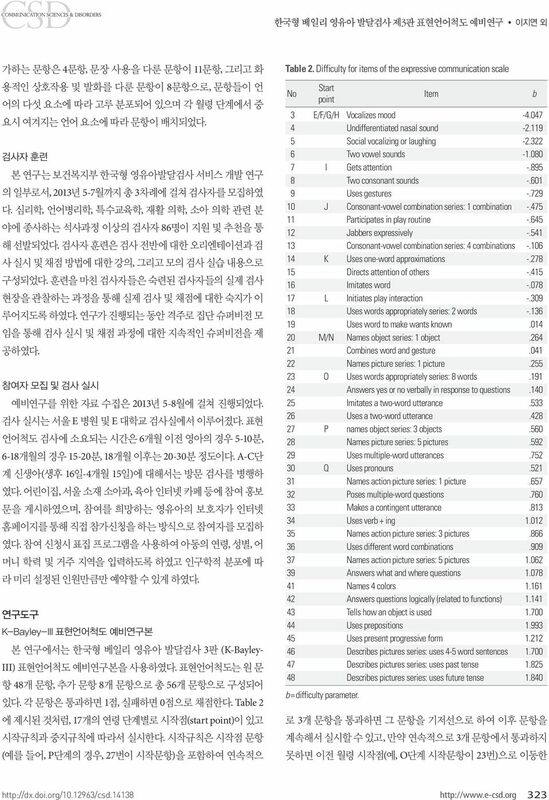 Objectives: The purpose of this is a preliminary study on developing the Korean version of the Expressive Communication Scale of Bayley-III (K-Bayley-III) by analyzing the components and difficulty of each item and examining whether the items are socio-culturally and linguistically appropriate for assessing the expressive language skills of Korean young children. 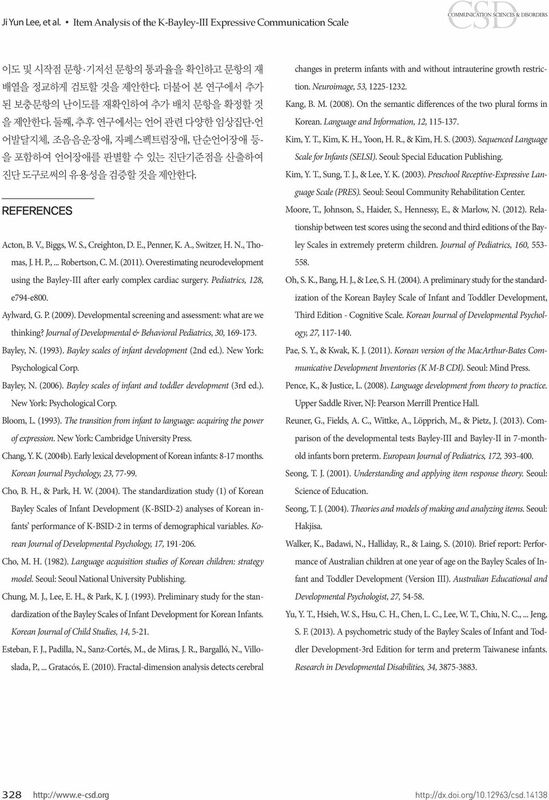 Methods: A total of 48 original items and 8 additional items were translated, reviewed, modified, removed, or added to the latest version of the K-Bayley-III expressive communication (EC) scale and were used to assess the expressive language skills of 373 Korean infants and toddlers between ages 16 days and 42 months, 15 days residing in Seoul and Gyeonggi province. Results: Overall, items were appropriately placed in the order of difficulty, and those with inadequate difficulty levels were replaced, modified, or removed. Most baseline items showed a 90% pass rate. Inter-item consistency showed acceptable levels and items were highly reliable in terms of test-retest reliability and inter-rater reliability. Items from the EC scale showed significant correlations with the Language scale, RC scale, and motor scales, and also demonstrated high levels of content validity and concurrent validity. 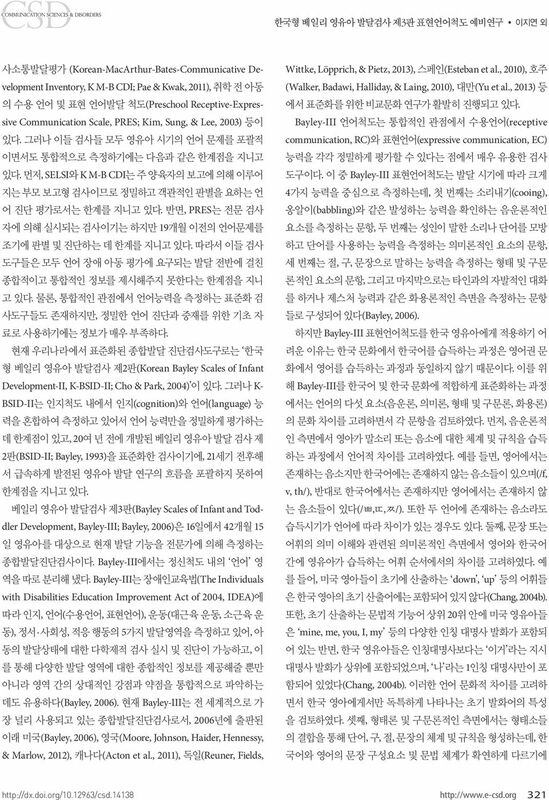 Conclusion: These results indicate that the K-Bayley-III Expressive Communication scale could be used to assess the general expressive language development of Korean infants and toddlers. 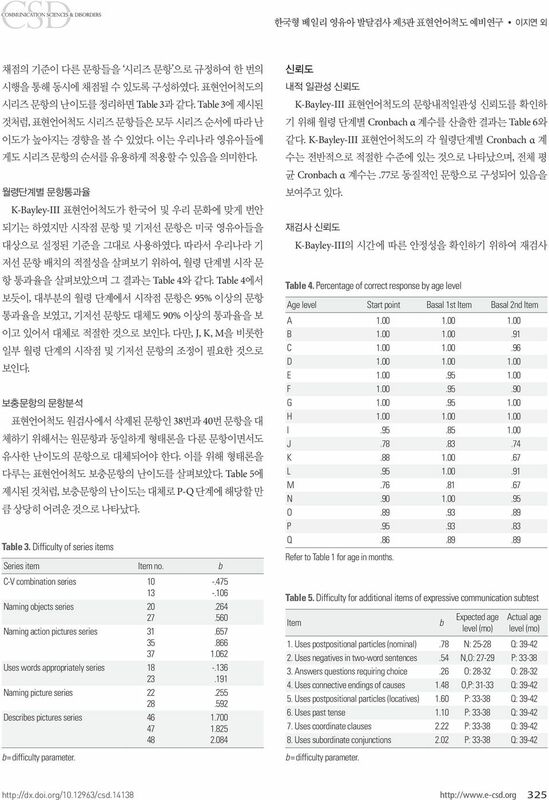 Items that did not reflect the characteristics of Korean language development were suggested to be replaced or modified in order to develop a final version of the standardized K-Bayley-III expressive scale. 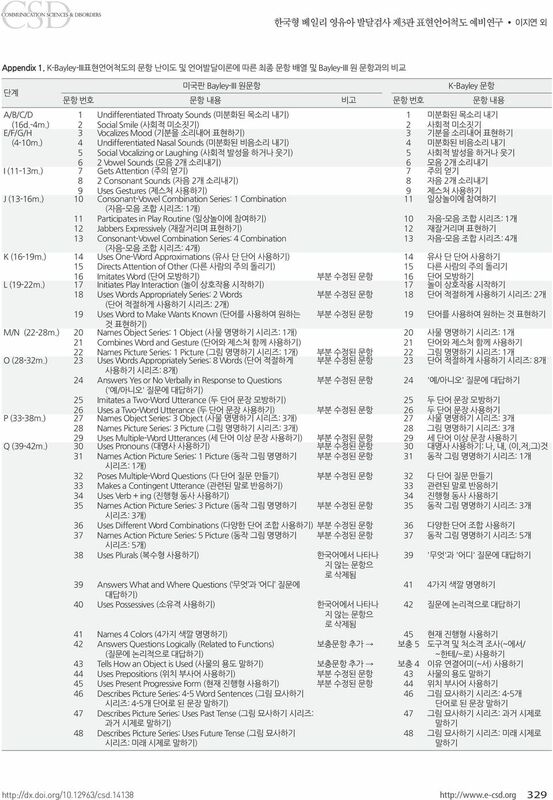 Keywords: K-Bayley-III, Expressive Communication, Item analysis, Reliability, Validity 이차 언어장애는 발달장애나 뇌 손상 등으로 인해 이차적으로 야기되는 언어장애로, 언어 문제로 내원하는 아동의 상당수가 이 차 언어장애를 가진 영유아이다(Pence & Justice, 2008). 이차 언어 장애를 가진 영아들은 선천적으로 언어기제가 취약하므로 생의 첫 1년 이내부터 언어문제를 보이곤 한다. 전형적으로 영아기에는 옹 알이나 제스처와 같이 결정적인 언어적 전조를 획득하는 것에서 지체를 보이며, 걸음마기와 학령전기에서는 첫 낱말의 발화, 낱말 을 조합하여 문장 만들기에서의 지체를 순차적으로 나타낸다(Pence & Justice, 2008). 한편, 영유아기는 발달의 가소성이 가장 커서 조 기 중재로 인한 교육 및 치료 효과가 가장 높은 시기이다. 이에 따라 영유아기에 발생할 수 있는 다양한 발달적 문제들을 범주화하고 이를 조기에 판별 및 진단할 수 있는 검사도구의 필요성이 계속 대 두되어 왔다. 또한 영유아기는 전 생애 발달의 출발점으로 신체, 인 지, 언어, 정서, 생활습관 등 모든 요소가 기본적으로 발달하므로 발달 전 영역에 걸친 균형 잡힌 성장과 발달과업 성취가 중요한 시 기이다. 특히 한 영역에서의 발달문제는 다른 영역의 발달에 영향 을 미치므로, 영유아기 발달에 대한 접근은 영역별 개별적 접근보 다는 다학제적이고 통합적인 관점에서 이루어져야 한다(Aylward, 2009). 현재 한국에서 시행되고 있는 표준화된 영유아 언어 진단 검사 로는 영유아 언어발달 검사(Sequenced Language Scale for Infant, SELSI; Kim, Kim, Yoon, & Kim, 2003), 한국판 맥아더 베이츠 의 Copyright 2014 Korean Academy of Speech-Language Pathology and Audiology This is an open-access article distributed under the terms of the Creative Commons Attribution Non-Commercial License ( by-nc/3.0) which permits unrestricted noncommercial use, distribution, and reproduction in any medium, provided the original work is properly cited.